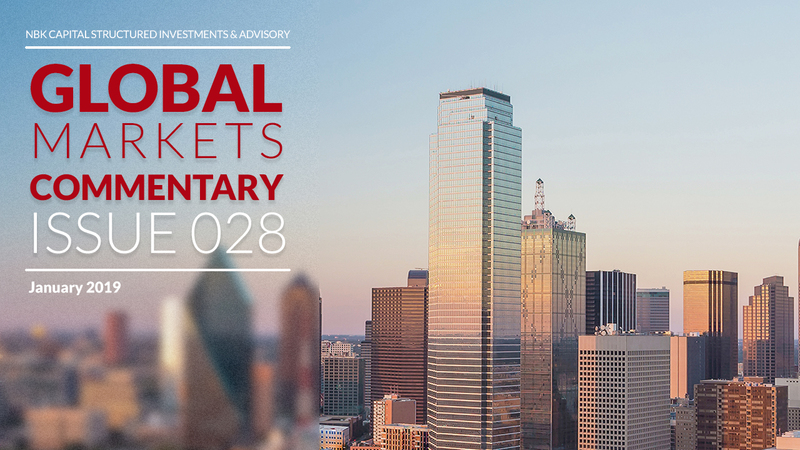 Kuwait- February 2019: The New Year seems to be starting on a positive note after the turmoil that swept markets during the last few months of 2018. Indications of a resolution to the trade war between the US and China is offering good support for global markets. Moreover, the January Fed statement has confirmed market expectations of a more dovish fed going into 2019. In its last statement, the Federal reserve dropped the phrase “further gradual increases” and replaced it by “will be patient as it determines what future adjustments to the target range for the federal funds rate may be appropriate”. Effectively the Fed signaled a pause in tightening for the time being and even left the door open for a cut if and when necessary. Volatility has receded gradually during January and by the end of the month was almost back at pre-correction levels, while markets seem to have completely ignored the longest shutdown in US history. The MSCI All Countries World Index started the first month of the year well into the green with a positive performance of 7.80%. Major US Indices reversed the biggest part of their December declines and ended January with solid returns. The S&P 500 was up 7.87% followed by the Dow Jones Industrial Average with a 7.17% advance. The tech-heavy NASDAQ was the leader however, with an advance of 9.74%. Treasuries yields remained almost unchanged compared their end of 2018 levels as the 10-year bonds closed the month at 2.63%. Industrial activity picked up in January as the ISM Manufacturing Index rebounded to 56.6 from 54.1 and beating expectations of 54.2. The blowout numbers for January, however, came from the Non-farm payrolls which showed the US economy adding 304K jobs compared to consensus of 165K. The unemployment rate remained stable at 3.9% while average hourly earnings came in below expectations at 0.1%. The global rally extended to Europe as the Stoxx Europe 600 Index climbed by 6.23% during January supported by a 5.82% gain for the German DAX and 5.54% for the French CAC40. Europe’s fourth quarter preliminary GDP increased by 1.2% year-on-year. Industrial activity weakened further in January as the Market Manufacturing PMI declined to 50.5 from 51.4, just half a point away from contraction territory. The Market Services PMI wasn’t so far behind at 50.8, while consumer confidence deteriorated further to -7.9 below a consensus estimate of -6.5. Over in the UK, even though equity markets were able to join the rally, the FTSE100 added only 3.58% underperforming its global peers. Industrial activity retreated as the Market Manufacturing PMI recorded 52.8 compared to a revised 54.2 for December and a consensus estimate of 53.5. Consumer confidence in economic activity remained unchanged with the Gfk Consumer Confidence Index recording -14 for January. Japanese equities started the year on a good footing with the Nikkei 225 Index increasing by 3.79% during January after having declined by more than 10% during December. The Nikkei Manufacturing PMI came in at 50.3, marginally above consensus of 50.0 and down from 52.6 in December. The unemployment rate edged marginally lower to 2.4% meeting expectations and down from 2.5% in December. Emerging markets were among the best performers globally during January. The MSCI Emerging Markets Index advanced by 8.71% during the month closing a significant part of the gap formed in 2018 when the index lost more than 16% of its value. The MSCI Asia ex-Japan closed the month up 7.28% while other major emerging markets had a very strong January led by Turkey and Russia with gains of 14.03% for the BIST 100 and 6.41% for the Russian Stock Exchange. Oil continued its reversal in January, with Brent up 22.6% to USD 61.9/bbl from its December 24 low until the end of January and WTI up 26.47% to USD 53.8/bbl over the same period. Oil markets were bolstered by Saudi Arabia’s announcement that it expects to reduce its oil output further in February to levels well below the levels set in the OPEC+ agreement. Oil markets found further strength from the political crisis in Venezuela and the tightening of US sanctions. GCC markets joined the global rally in equities. The S&P GCC composite advanced by 7.38% during January led by Saudi Arabia, with the Tadawul All Share Index up 9.4% for the month. It was followed by Qatar Exchange Index at 4.09% and Bahrain Bourse All Share Index which advanced by 4.05%. Abu Dhabi and Dubai also ended the month in positive territory with 2.64% and 1.50% for the ADX General Index and the DFM General Index respectively. Kuwait had a robust month with the Boursa Kuwait All Share Index ending 2.49% in the green. Oman’s MSM 30 Index was the only GCC index that closed the month down as it retreated by 3.64% in a continuation of last year’s weakness. The broader S&P Pan Arab Index was up 6.44% with support from Saudi Arabia and Egypt which saw the EGX30 advance by 8.37% in January.